Methods | Automedia: Family Cars Media. In order to gain a clear understanding of behaviour within cars, the research involves data collected from a number of family car-based travel episodes, including, shopping trips, holiday travel, sports events, the school run and lifts. Data collection is based on video-ethnographic techniques (e.g. Suchman and Trigg, 1991; Hindmarsh and Heath, 2007), supplemented through the use of interviews to provide contextual detail and give coverage where access and video data collection is limited. For the ethnographic portion of the data collection, the researcher visited the homes and travelled with participating families in typical family car journeys. 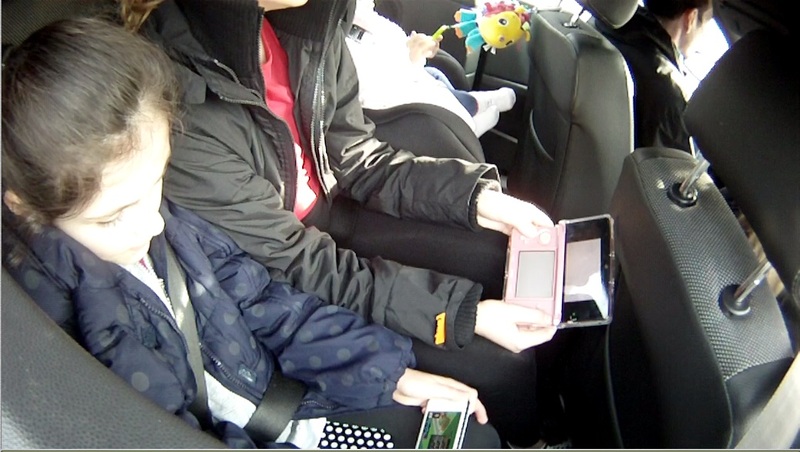 In addition, families were given cameras to capture in car video data using a multi-camera recording technique to film inside the car with paired cameras capturing activities on the front and back seats during family car journeys. The research therefore examines traveller’s activities both within the car during their journeys, as well as exploring behaviour around the journey itself. The current research takes is loosely based on ethnomethodologically driven ethnography where the researcher as an ethnographer enquires into the reasoning and methods for accomplishing situations used by particpants(Crabtree et al, 2000). The analysis is done by drawing the theoretical basis from ethnomethodology, conversation analysis and interaction analysis to explore the organization and interaction around media use in family cars.